Turkish and Russian foreign ministers Mevlut Cavusoglu and Sergey Lavrov held a meeting 39th meeting of the Council of Foreign Ministers of the Organization of the Black Sea Economic Cooperation (BSEC) in Baku Dec. 14. Speaking to journalists following the meeting, Cavusoglu said he discussed a number of issues with his Russian counterpart. “I discussed with my Russian counterpart a number of issues, including trade, a gradual abolishment of the visa regime, implementation of joint project. We also exchanged views on the situation in Syria and regional issues,” said Turkey’s top diplomat. Cavusoglu noted that there is a very intense dialogue between the Turkish and Russian leaders. “We mulled the decisions made the presidents of the two countries, as well as the recent Kerch Strait incident,” he added. 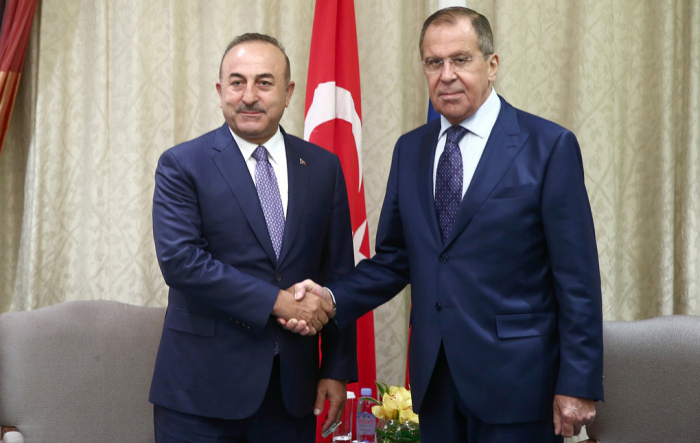 A bilateral meeting of Turkish and Russian Foreign Ministers Mevlut Cavusoglu and Sergey Lavrov is being held in Baku on Dec. 14. The meeting is being held as part of the 39th meeting of the Council of Foreign Ministers of the Organization of the Black Sea Economic Cooperation (BSEC). Cavusoglu and Lavrov are discussing the issues of bilateral cooperation of the countries and other topical regional issues. The 39th meeting of the Council of Foreign Ministers of the Organization of the Black Sea Economic Cooperation member-states is being held in Baku under the chairmanship of Azerbaijan.